Author Nick Petrie speaking with Lake Effect's Bonnie North. For someone who is not himself a combat veteran, Milwaukee writer Nick Petrie sure gets it. Last year, his debut novel, The Drifter, came out to great acclaim. The book was a thriller, and featured fictional Wisconsin native Peter Ash, a veteran of multiple tours of duty with the Marines in Afghanistan and Iraq. And while he made it back to Wisconsin sound in body, his mind was less intact. 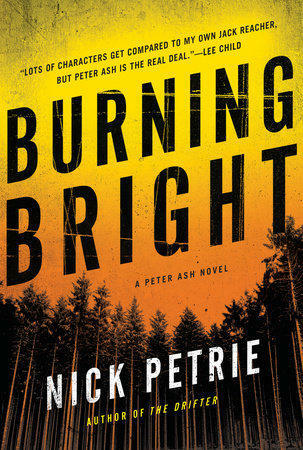 Petrie's second book, Burning Bright, starts with Peter Ash amidst the redwoods in northern California, still struggling with the PTSD that afflicts him. "People do things in war that, I mean this is one of the sources of post-traumatic stress. And in a way your brain's rewiring itself, but there's also this cognitive dissonance between what we're supposed to do, what your job is as a marine, or as an army infantryman, or as an air force pilot, and what we've been conditioned to do by society," says Petrie. The book opens up a larger dialogue about veterans suffering from PTSD, and the complex relationship many soldiers have with their time at war. "It's interesting when you talk to combat veterans, they may go to war thinking about their country or trying to protect the place they come from, their town or their state," says Petrie. "But in the end, and I've heard this over and over, and I've read this over and over, they're fighting for the friend beside them. They're fighting for their buddies." Novelist Nick Petrie will be at Boswell Book Company the night of January 10 to discuss his latest thriller, Burning Bright. After a couple trips to Norway, Wisconsin writer Sandy Brehl knew she wanted to write a story about the Nazi's occupation of the country. "I was sure that Norway had been neutral, the way Sweden was or Switzerland was, and it turns out that wasn't the case at all. And their stories just were so embedded with national pride and resilience and humor," says Brehl. "The humor particularly struck me, and I came away knowing that I'd want to write those stories." The British newspaper The Times once described Meg Rosoff's literary output thusly: "Searingly well written, her books read like Samuel Beckett on ecstasy." Perhaps best known for her first novel, How I Live Now, Rosoff's books often feature a teenaged protagonist exploring what it means to live in a world not of one's own making. This conversation originally aired November 11, 2016. Like many mystery novel protagonists before her, if you come in contact with the character Chloe Ellefson, there's a good chance that someone is going to end up dead.